Castle Builder is rated as one of the more exciting online video slots. The game contains what is called an interactive castle building game during game play, and the construction of these castles is the primary theme of the game. The slot machine has 5 reels and 15 paylines, and the slot machine is situated in a smaller section on the right of the screen. The entire left hand side of the screen is allocated to the construction of the castles. Players spin the reels in order to obtain the various building materials that are required for the castle, like bricks, bronze, silver and gold. Clearly the more precious metals that are landed on the reels equates to higher vale castles constructed at the end of the day. Castle Builder, in terms of stake settings and coin denomination settings is a penny slot. Suitable and targeted primarily at players wanting as much slots play as possible with lowered risk, the minimum bet is just 0.15 coins. The maximum bet per spin is 15 coins, and even this is certainly not high foller stakes. This is a game designed and produced by Rabcat, although it now falls into the acclaimed Microgaming portfolio. Described as a highly interactive slot game, Castle Builder slots game is set in a medieval kingdom. The storyline is all about a king who, in an attempt to marry off his daughters builds castles for them. The symbols on the reels in Castle Builder slot all relate to the theme of the game. This means the King, his son and two daughters. Further symbols include a bag of money, a jewellery box, a treasure chest and a locked door. The Wild symbol in the Castle Builder slots game is the Architect. The main feature of this slots game is to land on at least two of the required building materials on an active pay line. Two of the building materials icons will be rewarded with two standard value building blocks. Three building materials symbols translates to bronze value blocks, and four building materials icons is awarded with silver value blocks. The highly prized gold value blocks need five building materials icons to appear. Hypothetically this is an interactive aspect of the game, and the more valuable the blocks that are won, the more valuable the castle built at the end of the day and the more money you can win at your favourite NZD online casino. As building blocks are landed in the slot machine on the right of the screen, so the castle on the left become more and more built up. Once finally built and completed, it becomes time for the princess to move into her new home. She selects one of the suitors, with the players’ help. Once selected, the suitor reveals the fortune he has been hiding, which then is added to the players’ total. The value of the suitors is based on the overall value of the castle built. 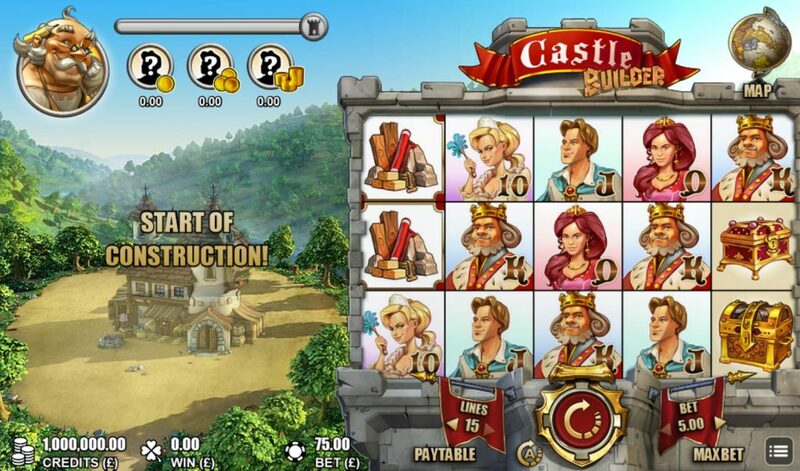 Players of Castle Builder slots game will then start the construction of the next castle. This will be for the next Kingly offspring and might be male or female, as there are various kings and kingdoms available as the game progresses and players move through the levels.